If the people you share this cake with don’t hug you, then you hug them. It doesn’t matter who initiates a hug–either way you get an oxytocin boost. Oxytocin is the love hormone, and if you get enough of it, you won’t be as tempted to devour the whole cake yourself; you’ll be inclined instead to pass it along, to share it with everyone in the neighborhood. After last Sunday’s taste of the almond danish swirls made by 3-Royal Waterfront Suites owner/innkeeper, Daneisha Hazard–I was happy. Whether it was the almonds, or the talk and laughter we shared in the sunshine overlooking the harbor, something kept me craving more of that. The other morning I woke up still craving more of that, and in the mood to bake. But checking my pantry, I found I was missing two key ingredients in Daniesh’s recipe–the cream cheese and the crescent roll dough. But I didn’t want to wait an hour for the dough to raise before I could even start assembling and baking. So, I invented an almond sour cream coffee cake instead. It was awarded the “Wow!” stamp of approval from all the taste-testers (with hugs). Instead of making another one and devouring it, I’m sharing the recipe. Important note: I mixed the cake by hand, without a mixer. Go ahead and use a mixer if you can stand that whirring electrical machine noise early in the morning, but you might get a different texture cake, and you will have to figure out your own way to whip the happy thoughts and love in, because those flowed right out the end of my fingertips, through the fork and into the batter. Stir together the sugar, flour & cardamom, then add the butter and pinch together with your clean fingers until you have a nice crumble. Think enjoyable thoughts, for example, about how fun it used to be to make mud pies. 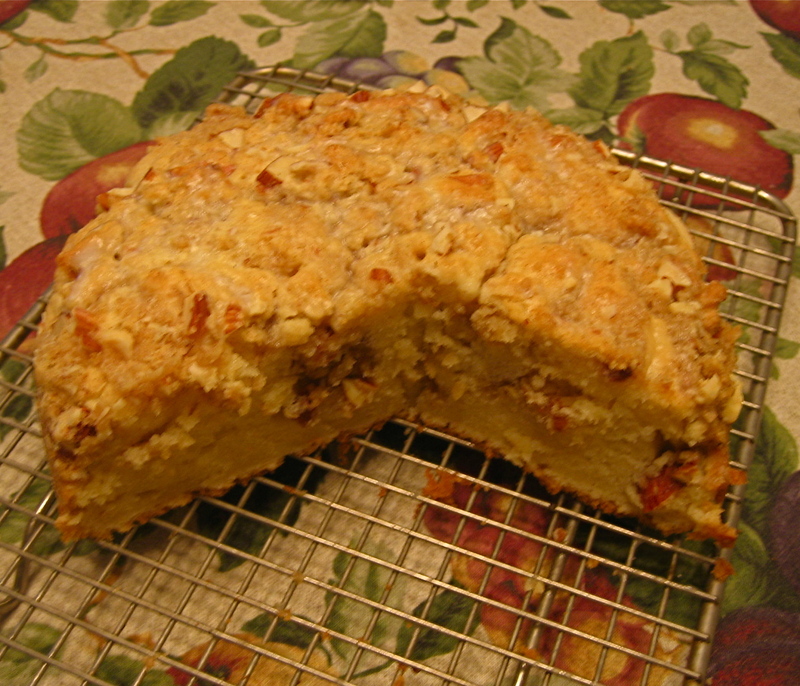 Add the almonds and refrigerate the streusel while you make the cake. Preheat the oven to 350 degrees F. Grease and flour a 10-inch tube pan with a removable bottom (or use a spring form pan, but allow extra baking time). Use a fork to cream the butter and sugar together in a large bowl. Think about how much you love, love, love the people you’re baking this cake for, how grateful you are that you have the time to do this, how much they love you–and let those thoughts trickle through your fork into the butter/sugar. (Those thoughts are so sweet, this cake actually gets by with 33% less sugar than a regular coffee cake). Add the eggs one at at time, keep adding that love while mixing and then add the almond extract and sour cream. Stir with love. In a separate bowl mix together the flours baking powder, basking soda and salt (if using). Slowly add the flour mixture to the creamed mixture (keep adding love to sweeten up the batter), stirring until completely combined. Spoon half the batter into the pan and spread it out with a knife or spatula. Sprinkle with 1/2 the streusel. Spoon the rest of the batter in, spread it out, and sing a happy song while you sprinkle the rest of the streusel over the top. Bake for 50-60 minutes, until a tester comes out clean. Let cool on a wire rack for at least 30 minutes. Carefully transfer the cake streusel side up (this is why you need a pan with a removable bottom, so you don’t ruin your good mood when you’re trying to unmold the cake), onto a serving plate. Whisk together 1/2 cup confectioners’ sugar; 1/2 teaspoon almond extract; and 2 tablespoons half & half or whole milk. Use a spoon to drizzle the glaze over the cake. Did you know hugs provide essential daily nutrients? About the cardamom–if the cake is warm, you barely taste it. But after it cools, there is just that hint of something, so that even my super-taster-tongue husband had to ask (wasn’t sure) “Is that cardamom?” When I asked him if it needed more, he said no, it’s teasingly perfect. Your cake looks wonderful – do you do take out? As I have a horror of baking I’m skipping straight to the hugs. Lovely post. Jenny, I often deliver around the neighborhood… saves me from consuming the calories and gets me extra hugs. Oh, YUM! Tracy, you really need to write travel pieces–where to go and stay, what to do…and then how to make your own versions of delicious, delectable foods! I’m glad to know this is working–I’m having FUN with it; and plan to keep it up. Have a great long weekend, Tracy! Thanks, Stefano. I hope you and Francesca have a terrific long weekend, with good weather and great food & wine, too! This cake looks very delicious! Would love to try a piece – after my vacation I’m definitely going to try this one. I love, love, love the happy and loving thoughts – and the “clean fingers”! And I’m with Marylin on you writing about travel and food! Why not your own tv show! p.s. I actually do that–pray/think loving thoughts while I”m baking. I think it makes a better product. Aw… that would be nice.